Millions of animal lovers love their casts but probably just as many of them hate cleaning the litter pan. Cats can definitely make even the cleanest home smell terrible which is why these self cleaning litter boxes have become so popular. Not only do they reduce the odor in the home, they eliminate the need for anyone to touch dirty and unsanitary litter boxes again. We looked at the 10 most popular self cleaning litter boxes on the market and compared their efficiency, frequency of cleaning, litter required, amount of owner interaction needed, size of the box, ease of set up and more. These three models topped the list in all of the categories we looked at. Any one of them would be an excellent addition to a cat owner’s household. The new models of self cleaning litter boxes are much quieter than their older counterparts. They are much more efficient as well. If you are searching for this type of litter box, there are some things you want to look for before you purchase to ensure you are getting the best one for your money. We will help you sort through the different types and brands so you can select the right one for your specific litter box needs. The prices of these models will vary from the very inexpensive to the ones that cost a couple of hundred dollars. All self cleaning litter boxes are not created equal so we will provide you with the insight you need to determine if the price of the model you are considering is worth it in terms of quality, efficiency and performance. ScoopFree Ultra Self Cleaning Litter Box will keep the litter box clean for weeks and you won’t have to touch a cat scoop or box of litter. The crystal litter will absorb any urine and provide 5 times better odor control than any other litter. The design of the litter box works to rake the waste into a closed compartment that provides exceptional odor control. The litter trays are disposable and have leak-proof linings which makes clean up super easy. There is an adjustable timer that can be set for three different timing choices. The safety sensor will reset the timer if a cat comes back into the litter box. The hood provides them with plenty of privacy and cuts down on the amount of litter that gets tracked out of the box. This fancy litter box is the world’s only self flushing and self washing litter box. You will never have to change, touch or even buy cat litter again. 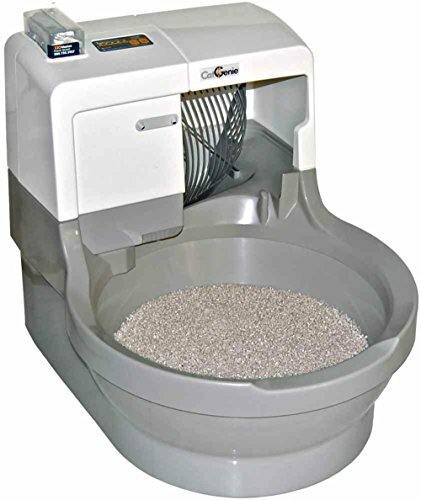 This system doesn’t use regular cat litter it uses washable granules that are like litter. This satisfies the cat’s need to dig and cover their droppings. This advanced system has to be placed near an electrical outlet and it requires a hook up to cold water as well. The CatGenie self cleaning and self flushing system is germ, litter, odor and dust free. It automatically washes and dries itself and sanitizes itself as well. Set up is easy once you figure out where to put it. If your bathroom is big enough and you can replace your rigid water line with a flexible one. The only tools you need are a wrench and a pair of pliers. A biodegradable and recyclable cartridge and 1 box of washable granules come with the CatGenie and should last about 2 months for a multiple cat household. This terrific unit has several activation choices that can be set. Owners can set it to be active for 14 hours and off for 10 with either 10 or 30 minute delays after the cat uses the bathroom; or you can set it be active 24 hours with either a 10 or 30 minute delay after the cat uses the bathroom. Each CatGenie Cartridge holds 120 washes which can be extended to 240 when the box is set to cat activation. It is a fantastic way to have cats and not have to deal with the germs, bad odors and cost of using regular cat pans. 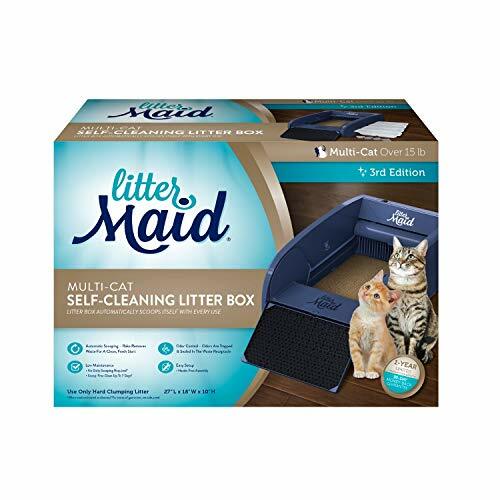 Littermaid’s self cleaning litter box makes having cats much nicer. The cleaning feature eliminates daily scooping of the litter box and keeps your home smelling fresh and clean. The box measures 14” x 17” and is large enough for multiple cat households and cats over 15 pounds. 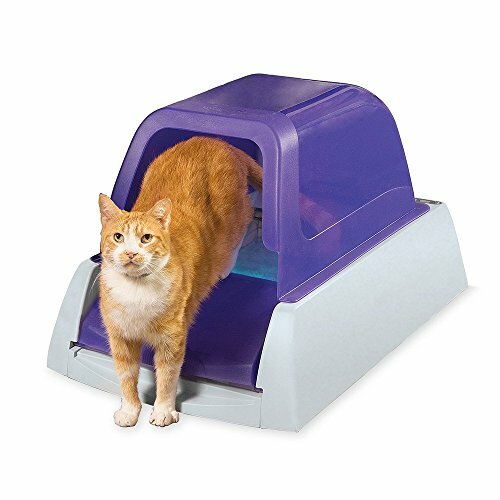 The paw cleaning ramp reduces litter tracking outside the box. The safety bar stops the rake if the cat gets back into the litter box while it is running. The rake is removable for when you need to clean it off. Other features of this convenient litter box include a removable litter tray, 4 sealed waste receptacles, battery back-up, and 4 carbon filters. There is also a scoop and litter measure that keeps the cat’s environment healthy. Self cleaning litter pans make having cats much more pleasant because it eliminates the number one complaint that all cat owners have: having to clean the litter box. With a self cleaning litter box, this activity is a thing of the past and there is very little cleaning to do. There are several models of self cleaning litter boxes on the market. The three that we have featured above are all excellent choices for self cleaning litter boxes. They are well made and through their various designs enable cat owners to be hands off when it comes to have to scoop the litter box multiple times a day. There is a small amount of maintenance that needs to be done in regards to throwing away the waste bags or receptacles. There also may be some occasional rinsing of the rake. This only needs to be done once a week or maybe even once a month. The only product that this will not need to be done is the CatGenie. There are several different models of self cleaning litter boxes on the market today in all price points. Before you choose one, make sure that you know the differences between the models so you can tell them apart and decide which ones meet your needs the best. Uncovered Automatic Litter Boxes – This is the most basic of all the self cleaning litter boxes. It has a standard, rectangular shape and offers the pet owner very simple operation. The sensor in these basic models activates the cleaning rake to do its job roughly 10 minutes or more after the cat leaves the litter box. Even the basic ones have charcoal filters to help with odor control. The owner will need to empty the waste receptacle which can be done very quickly into the biodegradable bags to reduce plastic waste. Basic automatic models can be used with any cat litter you choose. Contained Automatic Litter Boxes – This type is completely contained, giving the cat plenty of privacy which many cats need, and it reduces the amount of litter that gets tracked outside the box. A fully contained self cleaning litter box dumps the waste into a chamber underneath the pan. Owners can still choose the kind of litter they want to use. It is more costly than the basic model. Self Cleaning Litter Box w/ Optional Cover – Some self cleaning models have the option of purchasing a cover. They can be used either way depending on what the cat (and cat owner) prefers. The rake cleaning system does a good job of keeping the cat box clean as soon as the cat leaves the pan. The waste is dumped into a receptacle that the owner empties periodically. Flushing Cat Litter Boxes – This is a specialized kind of litter box that is self flushing, self cleaning and excellent for eliminating odors completely. The cost of this type of litter box is higher and it involves being connected to a cold water line and a waste water drain or toilet for it to work properly. Many people feel the sanitary aspects and the elimination of odor issues makes the cost and initial set up more than worth it. Below are some of the things you should consider when shopping for a self cleaning litter box. Size – The size of the litter box is an important factor to consider. Measure the space you think you will put the litter box and make sure that the models you are interested in will fit there without problem. You also want to make sure that you use a larger litter box if you have more than one cat. Frequency of Cleaning – Even with self cleaning litter boxes there is some maintenance involved and the waste receptacles will need to be emptied about once a week normally. The tray should be cleaned out once in awhile too. No more scooping several times a day. Where does the waste go? – Most models seal the waste that is raked away in an odor controlling waste trap that is covered. This helps to significantly reduce the odors that litter boxes usually cause. These traps should be dumped at least once a week although if you choose to dump them more that is okay as well. Warranties and Guarantees – Because there are working parts on these types of litter boxes, you want to make sure that they have warranties and guarantees of some kind. Especially the ones that is significantly more expensive. The normal warranty seems to be somewhere around 90 days for the money back guarantee and 1 year for the warranty. The more the better of course, but at least get the standard. When you are comparing models and looking around, look for these features before you purchase. Cover or Hood for Privacy – Many cats love to have privacy when they are using the litter box. If your cat does better when there is privacy, look for litter boxes that have covers. Most models either come with them or offer them as additional purchases. High Walls – Look for litter boxes with higher walls if your cat is a litter kicker and scatterer. Many cats make a HUGE mess with the litter. Having a litter box with high sides will eliminate this. Adjustable Cleaning Settings – You know how often your cats use the litter box. If you get a self cleaning litter box that has adjustable settings you can set the litter box to clean according to what you need. The more cats you have the more often you will want the box to self clean. Motion Sensors – A litter box with sensors will be able to tell when a cat enters the box and when they leave it. These also are equipped with safety sensors that will stop the cleaning when it senses a cat in the box again. Battery Backup – This is a good feature to have whenever there is a power outage. That is the only reason a battery backup would be needed but if you are out of power for even a day, odors and waste can build up so it is a good feature to have just in case. Self cleaning liter boxes take away one of the biggest deterrents to owning a cat and that is having to deal with a disgusting cat box. This type of litter box will take care of the dirty and unpleasant part and leave the enjoyment of having a cat in place. With all of the models on the market, it helps to know what to look for so you have the best experience possible. The information in this guide is designed to help you choose the right one for your needs.